Upon reaching level 60, you will need to MULTICLASS, which means you will be changing classes from your current one to another from one of the four class archetypes. In order to do that, you will need to collect a number of special gemstones - black tourmalines, which the Council of Seven uses as an energy source to provide magical power for some of their projects - and return them to any of the Quest Masters. Black tourmalines can be found in two locations - The Proving Grounds on Irda Isle, and inside the Tower of Riga on Verity Isle. 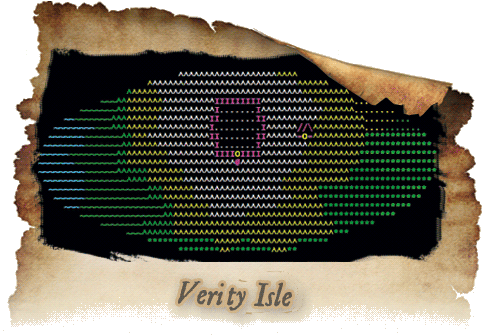 Many people start going to Verity Isle after they have practiced all their skills and decide to gain levels and experience in the Tower of Riga while gathering tourmalines. Verity Isle is restricted to those below 70 levels of experience. You don't need to collect all 250 and deposit them at once. You are allowed to hand them to the Quest Masters in small amounts each time. It doesn't matter which Quest Master you choose each time you deposit tourmalines, as the Quest Masters share your deposit information amongst themselves. The Tower of Riga on Verity Isle has eight floors, the layout of which changes occasionally due to the magic that permeates the area, left behind by the powerful Archmage, Riga, who has long since vacated the premises (after being stabbed in the back by his apprentice, Cassandra). The Tower is now loosely monitored by the Council of Seven as a training ground for novice adventurers. It has only one shop, one bank, and one fountain at the entrance, which have been set up by representatives of the Council. Many rooms in the Tower of Riga do not have a light source - so you will need to provide your own. If you possess the Light spell, you will be able to create a magical ball of light as long as you have the spell points to do so. If you do not have this spell, you'll need to either stock up on spell scrolls that are inscribed with that spell, or buy a lot of light sources, such as torches or lanterns. If you get a lantern, be sure to bring multiple vials of lamp oil in order to refill it. You will need a supply of food and water, if you are not a class that can produce them with magic (such as with the create food or the create water spells). A nice item to have for your adventures in Verity is a Decanter of Endless Water (or Blood, if you are a Fey or a Drow), which you may purchase from the questmasters Lord Agrippa or Lord Telleri when you have an appropriate number of quest points. If you can't afford those items, it is wise to buy rations and water skins - you can always refill the waterskins at the fountain in the Tower of Riga. If you can't afford to buy rations, you may eat legs/arms/wings/etc. of the NPCs you defeat. They are the same as rations, but they are not as reliable a food source. Insulated bags or strong boxes (from general stores) are useful to store the tourmalines you find. How many you buy depends on how many tourmalines you can carry or how many you want to get each time you visit Verity Isle. Make sure they are insulated so that combat and traps do not destroy them, and you are left with a pile of tourmalines you can't carry in your inventory. After you have bought all the items you need, you will want to re-evaluate your equipment and inventory - the Tower of Riga has a lot of traps that may destroy them (hence, the insulated bags and/or boxes to put everything in). In order to travel to Verity Isle and explore the Tower of Riga, you need to find a recently-retired adventurer in your nearest large Towne, and give him 25,000 gold to transport you. These retired adventurers may commonly be found loitering in several cities across Alyria. In Tellerium, you will find him northeast of the Town Square fountain. In New Rigel, you will need to ride the gondola in the canal and exit west. In Sigil, you will find him two rooms south of recall. In Xaventry, you will find him at the entrance of the Vandyne Temple. There are recently-retired adventurers located in additional spots as well. Once you are transported, head to the southeast and you will see the tower. Be careful as you journey across this wasteland as there are many aggressive creatures that will attack you without provocation. Be prepared to fight, or flee! Inside the tower on the ground floor, you will see a druid shopkeeper standing near a fountain. The druid sells food, water and light in case you run out. The room is also a bank you may use. When the time comes to leave Verity Isle, you need to give 10,000 gold to the druid, and he will send you to Sigil. 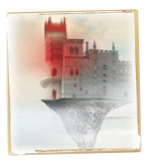 In the Tower of Riga, you also may obtain a mark that will give you extra practice points and experience. It is called the Mark of Patience. You will need to travel to the uppermost floor and find Cassandra. To get to her, you will also need to defeat the Ariel ancient who guards the entrance to the upper chamber, where Cassandra resides. When you have decided you have enough tourmalines (or simply cannot carry anymore) and have returned to your favorite large Towne, visit a Quest Master with the tourmalines in your inventory and use the CLASS command to deposit them. When you have enough tourmalines, you may use the CLASS command to change to a new class.